A helicopter with eight people on board made a forced landing at sea off the Bintulu coast Thursday, and the two pilots and six oil platform workers were rescued by a passing vessel, police said. 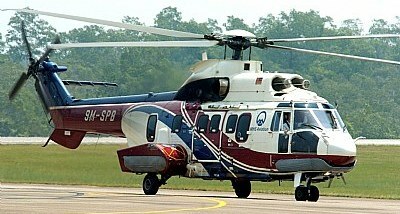 Bintulu Deputy OCPD DSP Mohd Said Ibrahim said bad weather forced the Sikorsky S-76, leased by a petroleum company, to make the emergency landing at 7.45 am. The helicopter was on a flight to identify oil and gas exploration sites when the weather condition worsened, he said when contacted by Bernama from here. None of those on board suffered serious injuries, he said, adding that all of them were sent to a hospital in Miri for treatment. They were fortunate that a vessel was passing the area and all of them were rescued, he said. It was not known what happened to the helicopter.